This is a delicious Indonesian recipe for Braised Chicken with white sauce (Opor Ayam). 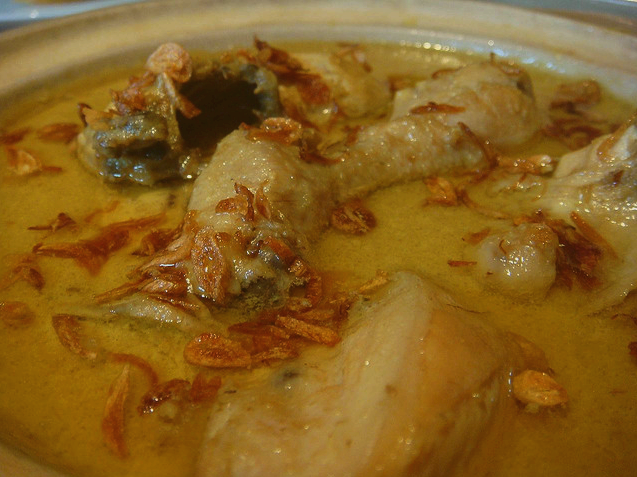 Other related recipes – Ayam Masak Merah, Ayam Kurma (Korma Chicken). For opor paste: Blend all ingredients in food processor to a coarse texture. Heat pan, add cooking oil and fry opor paste till golden brown. Stir frequently. Add lemongrass, lime leaf, bay leaf, lengkuas, cloves, coriander powder, cinnamon stick and nutmeg powder. Add chicken cubes and water. Bring to boil, reduce heat and simmer for about 30 minutes until 3/4 cooked. Pour in coconut milk and bring to boil again. Then simmer until meat is tender, sauce thickens and season to taste. I have awards for you over at my blog. Please stop by for a while to get it when you can. Happy Blogging!